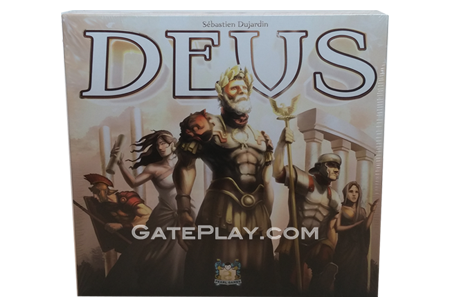 Drake says: "In Deus, players work to develop their own civilizations in a shared environment." Each player starts the game with five building cards, and on a turn a player either uses one of these cards to construct a building or discard one or more cards to make an offering to a god. Cards come in six colors: red for military, green for resource production, blue for trade, brown for scoring, purple for temples, and yellow for a variety of effects. When you construct a building, you build it in the appropriate location on the modular game board — which is sized based on the number of players with the hexagonal tiles composed of seven landscape "circles" — then you place the card in your personal tableau in the appropriate stack of colored cards and activate the power of all of those cards already in your tableau, starting with the card at the bottom of the stack. When you make an offering, you discard cards, then receive the help of a god associated with one of the cards that you discarded, with the number of cards determining the strength of the associated action. You then refill your hand to five cards. The game ends either when all the barbarian villages on the game board have been surrounded and attacked or when all the temples have been constructed. Whoever has the most points wins. Check out "Deus" on BoardGameGeek.com!